Generally speaking, the personalized service you get from a GOOD wine shop cannot be matched by an online retailer. There’s something to be said for face-to-face interaction with a human being who knows something about the wines on the shelf. Add in the touchy-feely enjoyment of picking up and handling bottles, and it’s next to impossible to re-create the experience through a website. However, there are some online wine retailers who do as well a job as can be done with the virtual process. In my opinion, the key is not to try to emulate the traditional retail experience but rather to make the most of modern technology to create a new / alternative way of selling. Such is the case with Porthos.com, a site that specifically caters to Napa and Sonoma wine fans. That’s an interesting and effective slant — targeting a very narrow area on the world wine map. Let’s face it, any run-of-the-mill online wine shop is going to have a hard time beating the varied selection and pricing of, say, a Wine.com, WineLibrary.com, or SamsWine.com. But Porthos can stake their claim as “the” place for high-end Napa and Sonoma wines — if that’s what you’re in to. Naturally, Porthos carries California’s finest, with bottles from well-known estates such as BV, Clos du Val, Far Niente, Etude, Dominus, Duckhorn, Chateau Montelena, and Cain Five, to the lesser-known, “cult” wineries such as Block 16, Barnett, Leeuwin, Newton, Coho, and Pahlmeyer — to name a few. There isn’t a dog in the bunch, a stark contrast to the many “faux-boutique” online retailers that push off unknown, ordinary wines as “undiscovered values”. What I really like about Porthos.com is the organization of the site. Because their selection is limited, it’s easy and enjoyable to browse. In particular, the “Best Buys Under $30” and “Staff Picks” include intriguing wines that even a geek will appreciate. Too often on other sites, I’m overwhelmed by the dozens and dozens of choices per varietal — while selection is nice, sometimes you just want someone to tell you “here, try this, it’s good stuff.” Based on what Porthos has currently put together in their “best buys”, mixed packs, and “staff picks”, I think they can be trusted. Last point: though they specialize in Napa and Sonoma, Porthos does have a few bottles from other areas, and also offers a very limited selection of “Passport International Wines“. Again, I have to say that I like what they’ve chosen; for example, their current choices include two bottles from Chateau Routas — who I think makes some of the best pink wine in the world — and a Cahors from Clos La Coutale (IMHO, one of the best bangs for your buck when it comes to Cahors). So if you are into the wines of Sonoma and Napa counties, I suggest you at least take a browse of Porthos.com and see for yourself. And please, leave your comments here on what you think of their selections and service. No doubt you’ve heard this one, especially if you subscribe to one of the large-format wine magazines, such as Wine Spectator or Wine Enthusiast. They review a lot of California Chardonnays, many of which may be described as “fat”. So what is meant by “fat” ? Luckily, it has nothing to do with your waistline. Generally, a wine that has a lot of fruit concentration but low acidity is often defined as being “fat”. If the acidity is so low it is displeasing, the wine may be called “flabby” or “insipid”. Though a lot of New World Chardonnays are described as “fat”, those aren’t the only wines that need to go on a diet. For example, Condrieu and other big white wines from the Rhone Valley have been described as such. Further, fat wines are not relegated to whites; on occasion you may see the term used in a red wine review. As a general rule, fat wines come from very hot regions, and as such also tend to be overly ripe and have high alcohol levels as well. Finally, fat wines are not necessarily bad; quite the contrary, in fact. Most often, “fat” is used to praise a wine’s generous fruit concentration, and is a complementary term to “mouthfilling”, “big”, or “round”. And don’t worry — fat wines have about the same amount of calories as “thin” wines, and are assigned the same amount of points by Weight Watchers. Austere is a major geek term that is often used to describe a young, expensive wine that critics assume will evolve into a blockbuster. The term austere is actually difficult to pinpoint; it is a vague definition of a wine that has a high level of acid and/or tannin, which currently overpowers the fruit, but is expected to soften with age. For example, a huge red Bordeaux or expensive California Cabernet may taste more like an ashtray than wine — when it is young. The flavors will be dominated by bitter earth and tar, acids may be oppressive (some people describe it as “bite”), and/or the tannins may leave your tongue feeling like it needs a shave. However, experienced connoisseurs — who have tasted similar wines in youth and later at maturity — may take the educated guess that the wine will eventually evelve into something much more drinkable. So instead of saying the wine is similar to licking hot tarmac, they’ll say it is “austere” (sounds a lot better, doesn’t it?). In all seriousness, if you hear or read the word “austere” in tasting notes, it almost always will mean that the wine is 1) expensive; 2) very young; and 3) after appropriate time in the cellar, the “hardness” (“hard” is a common synonym for “austere”) will soften, the fruit will come forward, and the wine should taste somewhere between good and extraordinary. By the way, if you are an advanced wine drinker and want to become more knowledgeable about wine, you should consider purchasing The Oxford Companion to Wine. Just about every wine term you’ve ever heard (and never heard) is defined in this massive tome, and it makes a nice paperweight. Click on the picture to the left to buy it from Amazon. Italy may be best known for Sangiovese, the base grape of some of the countryâ€™s greatest wines, such as Chianti and Brunello. 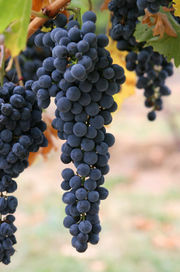 Rivaling Sangiovese is Nebbiolo, the fruit producing Barolo and Barbaresco. A third, lesser-known (at least, outside of Italy) yet just as supreme grape is Aglianico (ahl-YAHN-eh-koe). Grown primarily in the southern part of Italy, it does best in hot climates and volcanic soils. The grape ripens late in the harvest, and if done right will produce wines that are inky black, with firm-to-huge tannins, and a powerful structure that benefits from 5-10 years or more of cellaring. Common characteristics of Aglianico wine include a smooth, rich, texture and aromas and flavors of black fruit, dark chocolate, coffee, leather, smoke, and mineral. In other words, pretty complex. While traditional / old-school Aglianico wines tend to be too harsh and bold when young, many wineries are employing modern techniques to produce examples that are ready to drink upon release. Aglianico is an important grape in the Campania region, where it is the main ingredient in Taurasi. You may have never heard of Taurasi, but it is well worth picking up if you come across it. Aglianico also grows in the south-adjoining region of Basilicata, producing world-class wines called Aglianico del Vulture (donâ€™t say it like the bird; itâ€™s properly pronounced as vull-TORE-ay). Why go through all the bother of hunting down these hard-to-find, impossible-to-say, unusual wines? Three reasons: first, the quality is just as good as (maybe better than) Italyâ€™s best wines; second, many examples are enjoyable to drink right now (as opposed to sticking the wine in a cellar for 10 years); and third, you can find affordable bottles. Personally, I like the affordable part, especially when Iâ€™m staring at a shelf full of Barolos and Barbarescos that START at 80 bucks or more. In fact, some outstanding Aglianicos can be had for about half that price. But before you plunk down a pair of twenties, you can taste an introductory example for less than 10 bucks: Ars Poetica “Vulcano” (review coming in a few days), which is ready to drink now with burgers and steaks. Other brands to look for include Tenuta le Querce, Sasso, Di Majo Norante, Terredora di Paolo, Cantina del Taburno, Feudi di San Gregorio, and Caputo. In wine terms, cloying is used to connote a wine that is excessively sweet in flavor (sentimentality might enter the picture, though it depends on your mood). Like most descriptors used in wine tasting notes, it is a subjective term — what one finds cloying, another may find “just right”. However, seeing the term in a taster’s notes can be helpful to you. In nearly all cases, a wine that is described as “cloying” will have a high level of residual sugar, and therefore a sweet taste. Similarly, a wine that is described as ” .. ripe fruit, but not cloying .. ” suggests that it will have a flavor that might give the perception of sweetness, but not be overpoweringly sweet.